Antique Money – Not Sure If You Are Getting A Fair Price? Not Sure If You Are Getting A Fair Price? When To Consider An Auction? Any unique service provider can tell you how hard it is to convert first time sellers/buyers into customers. As an example, my brother runs a fencing company in Greenville, SC (free shout out). He deals with the same problem, but it has a solution. A fence is something you probably just buy one time. But it is easy to price. You can go to Lowes and check out supply costs and you can get 2-3 companies to quote the work. Maybe you get quotes ranging from $2,800 to $3,500. With that information it seems likely that no one is going to do the job for $1,000 and someone would have to be crazy to quote $10,000. Sadly, getting a price on a rare banknote isn’t as easy. Just because you talk to three dealers and get offers between $2,800 and $3,500, it doesn’t mean that the note couldn’t be worth $10,000 to the very perfect buyer. If you feel like you aren’t getting the entire picture, then consider auction. 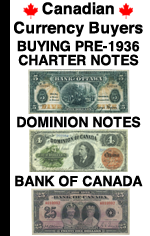 We know that it can be an intimidating process when it comes time to sell an inherited banknote or an entire collection. Each dealer you talk to tells you a different number and sometimes there is a huge range of values. It is understandable why you would never really feel comfortable selling, even if the amount you are being offered seems like a lot of money. Low Commission Rates: Most consignments are sold at only a 5-15% fee to the seller (just depending on the value of the consignment). 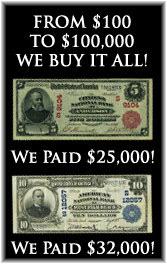 Great Exposure: Stacks puts together a full color catalog of all of the banknotes getting sold. Prior to the auction, that catalog is mailed to more than 1,000 collectors, dealers, and museums. Stacks has been holding coin auctions since 1933, and cross promotes their currency auctions to many extremely wealthy coin collectors. Internet Bidding: All auctions take place live and in person. Bidding also takes place real time using live internet bidding. Anyone and everyone can place a bid online no matter where they are in the world. 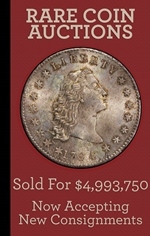 Marketing: Stacks advertises their auctions in numerous numismatic periodicals as well as dozens of websites. Through their marketing, your banknote is exposed to not just a handful of dealers that you could reach on your own, but also to the end users who are actual collectors. Free Auction Estimates: Of course there is never a charge for an auction estimate, nor is there any obligation to consign. Locations in NY and CA – Stacks has retail locations in Santa Ana, CA and New York, NY. 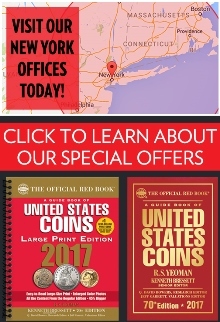 So you can walk-in and sell coins in NYC or setup an appointment at either location. But please remember that even if you aren’t local to NYC or LA, you can still work with Stacks from anywhere in the world.